To propose tax hikes, especially on the doorstep of a recession, is highly irresponsible. All this will do is continue to grow government on the spending side, and continue to shrink the private sector on the tax side. The result will be further erosion of the tax base and further growth in the state's structural budget deficit. I explained this last year, on numerous occasions, and I also pointed out several times that if our legislature continues to ignore this imbalance between government and the private sector, we will eventually reach the point of fiscal panic. Since then, others have backed up my worries: back in early October I reported on a new study from Standard & Poor that specifically warned about our state's fiscal future. Depending on fiscal outlook, S & P ranked us 15th to 19th in terms of fiscal vulnerability. They are attempting to diversify the tax base while nothing is being done on the spending side. The net result can only be one: higher taxes that make taxpayers poorer, short change government and defeat the very purpose of the tax base "reform" efforts. There is only one way to correct a structural imbalance between government and the private sector: reforms that permanently, structurally shrink government. Primarily, such reforms should focus on increasing private delivery of health care, expand private health insurance coverage, contain and shrink Medicaid, open up K-12 school choice, privatize the University of Wyoming, and place I-80 under tolls and private operation. To illustrate the benefits of shrinking government, let us take a look at a new, innovative statistical product from the Bureau of Economic Analysis (BEA). For the first time, they have published GDP data at the county level; so far the data is only published in "prototype" form which means that there can be minor bugs in the production that they still have not worked out. Nevertheless, the BEA is one of the world's top producers of economic statistics; over the many years I have relied on them for my own analytical work, I have never found a flaw in their statistical products. My only concerns have been with the occasional, carelessly written press release. Therefore, we can safely assume that their county-level GDP database does indeed represent economic activity as it has been for the years 2012-2015 currently covered. 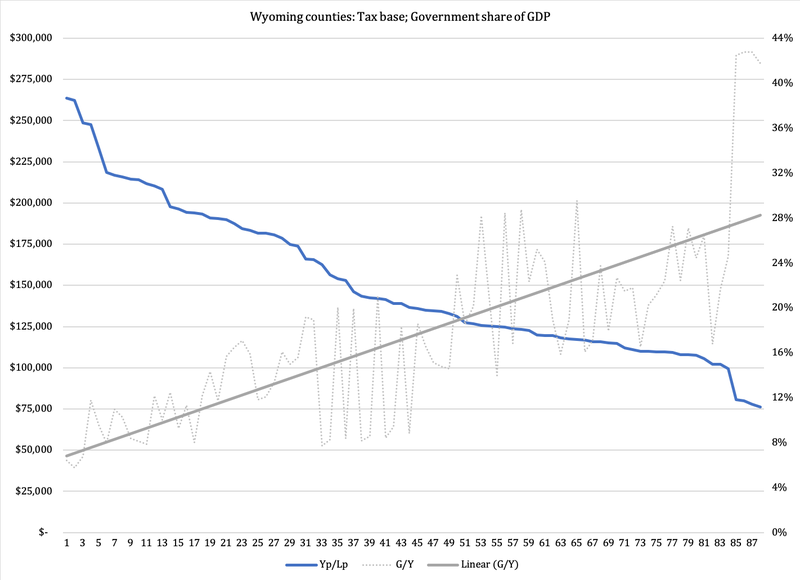 The numbers for Wyoming are quite interesting: the larger government (federal, state and local) is as share of a county's GDP, the weaker the tax base will be. We define the tax base as private-sector production (GDP for privately produced goods and services), divided by the number of private-sector employees. * We can think of GDP per employee as a measurement of the productivity of the private sector. The eleven first counties on the list, the ones that have the largest government sector, average $120,961 in GDP per private-sector employee. Government averages 24.3 percent of total county GDP. By contrast, the remaining eleven counties (we do not include Niobrara, as there are no employment numbers from that county) average 11.9 percent in government size but have a tax base of $174,091. It is worth noting the strikingly small tax base in Albany County. Not only are they home to the university, which is part of government, but they also have not been able to spawn off a thriving private sector. Strong research universities become attractor points for entrepreneurs, venture capital and new, innovative businesses. We don't have to go as far as to private research universities like Stanford, which was instrumental in the sprawl of Silicon Valley. All we need to do is look at the University of Michigan, Ann Arbor, which is a public school but gets over 90 percent of its funding from private sources. Thanks in good part to them, the Ann Arbor area is home to a strong business community. It is clear that the University of Wyoming could do better in this respect. There are several variables that qualify any conclusions from Figure 1, one of them being the concentration of minerals jobs to some counties. These are the only private-sector jobs that consistently outpay government, and the reason is the high productivity of those jobs. However, we should also keep in mind that the minerals industry only employs ten percent of the private-sector workforce in Wyoming; their influence may skew the results on the margin, but not across the board. A more important point to take away from this is one that I have pointed to for almost ten years now: when you allow government to grow to the proportions it has here in Wyoming, you also allow it to de facto monopolize the workforce in many communities. When we factor in wages, job security, benefits and total weekly hours, few start-up business can compete with government even for entry-level workers. Government de facto crowds out its own tax base. Conclusion? If you want a bigger tax base, shrink government. *) This definition tells us what the broadest possible tax base would be capable of, in terms of taxable production value. We divide private-sector GDP with private-sector employment to illustrate the point that in order for a business to produce a tax base, it needs employees; the more productive the employees are, the bigger is GDP per employee. As GDP per employee grows, the ability of the private sector to pay taxes will increase accordingly.